Today I bring you bread! 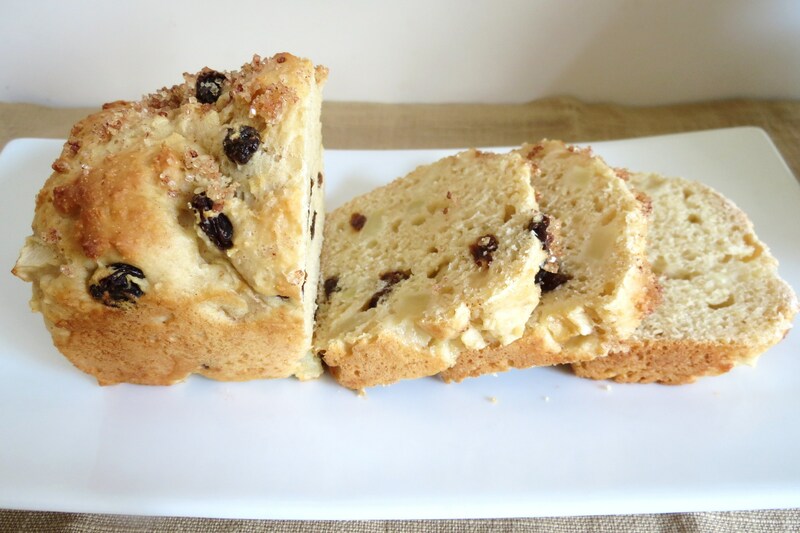 It’s been a while since I posted a quick bread and this one is a remake to an original. I felt my pictures on my original post just didn’t do the bread any justice. 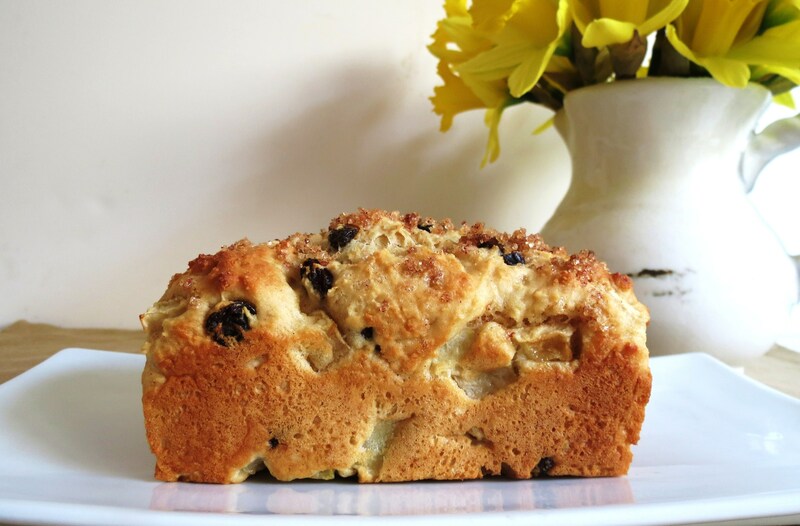 This bread is chock full of apples, super moist and is perfect for breakfast. It’s definitely in my top 3 favorite quick breads. In this version of the Apple Raisin Bread, I cut back the sugar and I added a turbinado and cinnamon sugar mixture to the top of the bread. I originally posted 3 different toppings to the bread and you can always add them if you like, but I honestly like this version better. When you look at the recipe you may notice something is missing, its butter and oil. There was none at all needed in this recipe. The moistness of the bread comes from 1 big cup of Plain Greek Yogurt, I used Chobani’s. Talk about a guilt-free bread, it only contains .4 grams of fat!! You have to love that! Toss apples in a ½ Tbsp. of sugar, ½ Tbsp. of cinnamon and ½ tsp of lemon juice, mix and set aside. In a small bowl mix 1 Tbsp Turbinado Sugar and ½ Tbsp. Cinnamon, set a side. In a medium bowl, mix yogurt,sugar, eggs and vanilla extract until blended. Fold in apples and raisins. Bake for 50 minutes to 1 hour for 1 large loaf or 35 – 40 minutes for 3 mini loafs, or until a wooden pick inserted into center comes out clean, shielding with aluminum foil after 50 minutes to prevent excessive browning. Cool in pan on a wire rack 10 minutes; remove from pan to wire rack. As you may recall I went to the Farmers Market last week and I picked up a big bag of raisins. I have never had such plump juicy raisins in my life. I used them in this bread and when you bite into them, they kind of pop! I hope they keep carrying the raisins, because I’ll never buy from the store again. 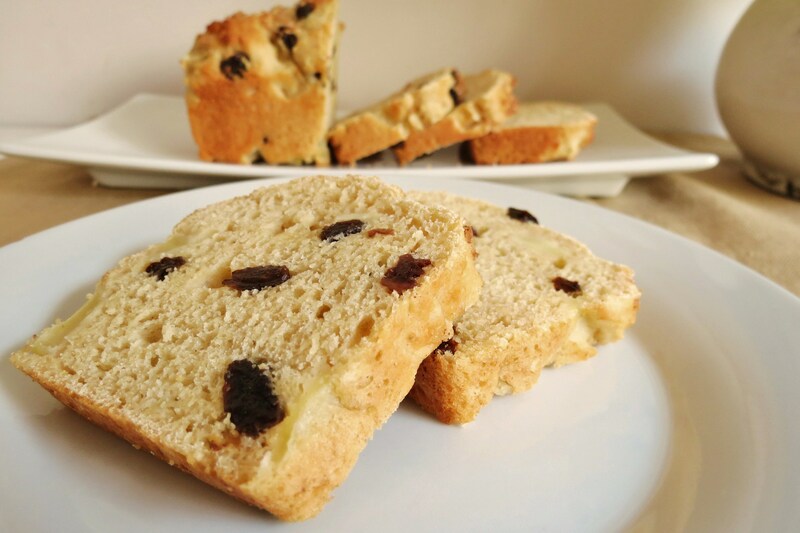 This bread will sure to please any Apple Raisin bread lover in your life. 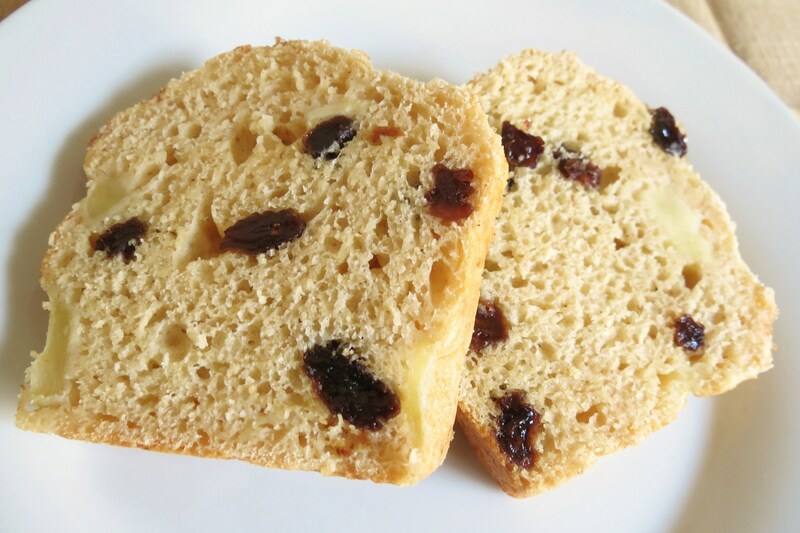 It truly is a wonderful quick bread. I am very pleased with the outcome. I am actually thinking of making french toast with it. I am betting that would be really good! Lucky for me I saved a loaf for myself, so I may try it this weekend. Oh, and if you make this bread, be sure to refrigerate it after about two days on the counter. It stays fresher longer! Time to do the dishes and get ready to watch Two Broke Girls, I just love that show. I hope you have a wonderful week! Don’t forget to enter my Trader Joe’s Giveaway!! 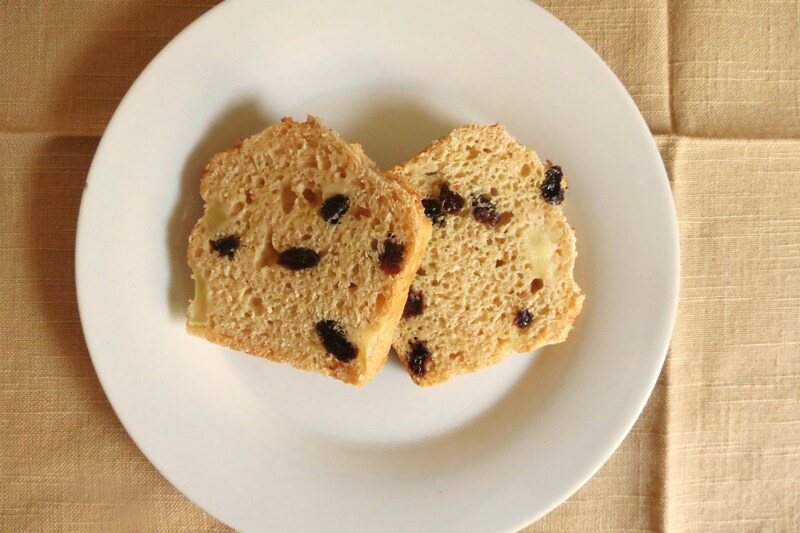 Dare I say, you’ve got the PERFECT quickbread right here! Not only does it have my favorite fruit, but it’s also low cal enough to eat for breakfast (and perhaps even smear a slice with peanut butter!). WIN. Oh, PB on it sounds wonderful! Dam I want a slice of it like that right now. maybe Peanut Butter with Cinnamon and Raisins on it. Yum!! I’m home sick today. I’m thinking I can drag myself into the kitchen for long enough to make myself feel better with this bread. YUM! Oh I hope you feel better soon! It seems something is going around right now! The bread will make you feel better and the smell as it’s baking is wonderful. P.S. I just got the plumpest, most beautiful jumbo raisin medley (regular, golden, and flame) from Trader Joe’s. If your farmer’s market runs out of those gorgeous raisins, these are pretty good! I had to cut them in half for my oatmeal this morning. Oh, I’ll have to try TJ’s raisins! Thanks!! The apple-raisin oatmeal sounds wonderful!!! I know the french toast sounds good and Hubby is already asking where the bread is. I have to hide it so I can make the french toast. I couldn’t agree with you more! I love bread, maybe a little to much!! Mmm looks good! 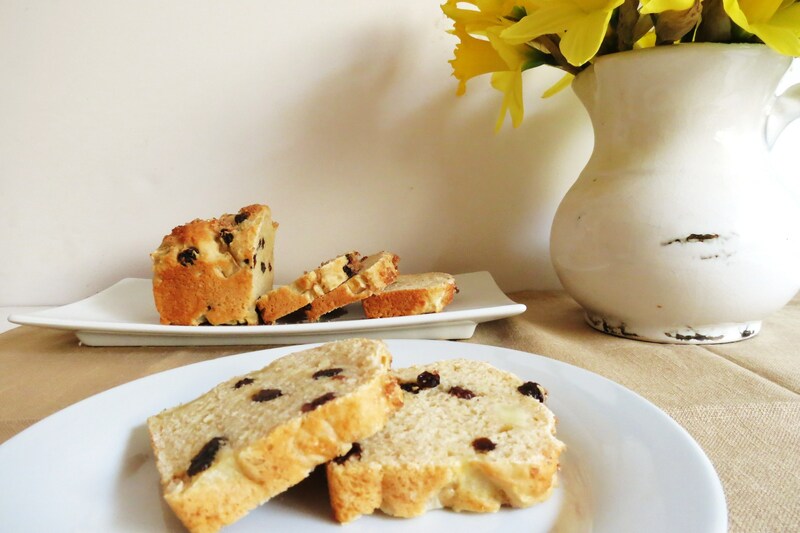 I love a good fruity bread recipe! This looks & sounds incredible! I love the chunks of apple and that there is no butter needed! Looks absolutely perfect for breakfast, can’t wait to try it out. Jen, it’s not only guilt-free, it’s beautiful!! I love all the texture! Sounds wonderful! Thanks Chris! That means a lot coming from you! This looks absolutely DELICIOUS!!! It looks like I might have to try & make it one of these weekends. Love the stats on this bread! Healthy AND delicious!!!! I want to make this ASAP! If you make it let me know what you think! Mmm, looks delicious! 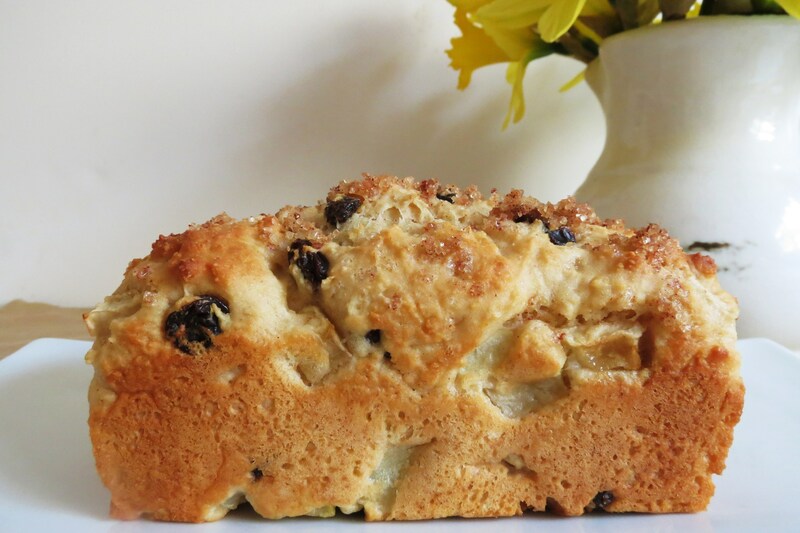 I don’t think I’ve ever had apple bread, actually, but I love all baked things with apple. If you love apples, than you will love this bread! It’s full of them and putting the apples in cinnamon and sugar really makes the bread. Thanks Erin! I am addicted to this bread!!! I could so eat the whole loaf in one sitting if I allowed myself too!! Lovely bread and also like that I can eat is on my WW weeks. Look scrumptious! Thanks Denise! So far I think it’s one of my favorite quick breads!! !